The National Football League is the most popular professional sports league in the country, but when it comes to the country’s three biggest cities, it takes a back seat to its competitors. A Morning Consult survey of 15,995 adults found that Major League Baseball is the winner for a plurality of residents in New York City and Chicago, the first- and third- largest cities in the United States. Forty percent of respondents in the Big Apple — home to the Yankees and the Mets — backed pro baseball as their favorite league to follow. And in Chicago, a town largely divided by its loyalties between the Cubs to the north and the White Sox on the South Side, 34 percent of the city’s residents opted for the MLB over other pro leagues. The National Basketball Association was No. 1 in Los Angeles, the country’s second-biggest city and home of the Lakers and the Clippers, where a plurality (34 percent) of its residents backed pro hoops. For other major cities with enough responses in the survey, the NFL got top billing: Nearly half of adults in Philadelphia (48 percent) and Dallas (49 percent) said they preferred the NFL to other pro leagues. 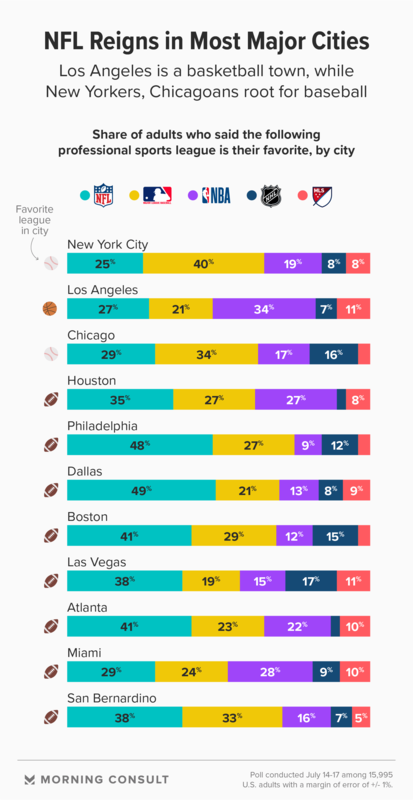 Smaller pluralities in Boston and Atlanta (41 percent each) and Houston (35 percent) and Miami (29 percent) also said they were NFL fans first and foremost. The survey showed the NFL making its mark in San Bernardino, Calif. — the largest metro area without a pro sports team — with 38 percent of residents in the city citing the NFL as their favorite. MLB also fared well there, with 33 percent opting for the pro league of America’s original pastime. And in Las Vegas, set to welcome the now-Oakland Raiders by 2020, a 38 percent plurality said that league was their favorite. Sin City just saw a historic inaugural season, with its new National Hockey League team, the Golden Knights, going to the Stanley Cup Finals before losing to the Washington Capitals. The survey shows 17 percent of Las Vegas residents catching puck fever, placing it in the ranks of legacy hockey towns such as Boston, Chicago and Philadelphia when it comes to interest in the league.